Ryoko Sekiguchi, writer ; Trami Nguyen, musician, visual artist and performer ; Sugio Yamaguchi, chef. Listen to the voice, the music and the sound of the food you bite under your teeth. Just as one never hears one’s own voice resonating in the body, when we eat food, the noise we make belongs to our "internal sounds". And what if all these sounds internal and external, unified to create a space-time? These three acts (voice, music, sounds of mouth) rarely associated, are woven and screened so that the public is ultimately awaken to the act of "listening." 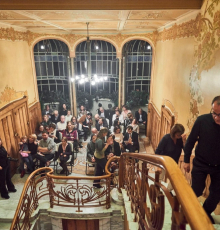 This performance-reading combines the voice of the Japanese writer Ryoko Sekiguchi, the original dishes of Chef Sugio Yamaguchi and the music of Trami Nguyen played on an Erard piano in the salon of the Max Hallet Mansion. Special thanks to Michel Gilbert who is allowing us to use the Max Hallet Mansion for the occasion.